Sausage Fest, presented by Brat Haus, a celebration of brats, pretzels, beer and sausage themed activities is set for Sunday, April 24, 2016. Taking over the open air beer garden at Brat Haus from noon – 8 p.m., Sausage Fest will feature Arizona’s longest brat and largest pretzel, a variety of exotic brats, a sausage selfie zone, sausage making demos, stein holding contests, bag toss, beer pong, and more games. 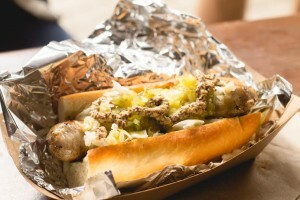 Last year, Brat Haus set a new record with their 93-foot-long brat, this year, they plan to hit 100 feet and beyond. Patrons can purchase a portion of the giant brat for $1 per inch, six inch minimum with 50% of the proceeds benefiting the ALS Association of Arizona. We had so much fun bringing this concept to life last year and it was such a huge success that we wanted to do it again. It’s a great opportunity for people of all ages to come out, have a good time, play some games and enjoy some awesome food,” said Dave Andrea, owner of Brat Haus. During Sausage Fest, guests can chow down on a variety of specialty brats, pickled goodies, pretzels, fries and smoked pig prepared by Brat Haus. To wash it all down, guests can also enjoy cold beverages and refreshing brews provided by SanTan Brewing Company, Krombacher, Grand Canyon Brewing and New Belgium Brewing. Presale general admission is $8 if purchased at Brat Haus and day of admission will be $10. Sausage Fest is an all age’s event, kids 12 and under are admitted for free. Nestled in the heart of Old Town Scottsdale, Brat Haus features Arizona’s most welcoming beer garden with 28 craft beers on tap. The menu features made from scratch cuisine inspired by European food craftsmen, offering a wide variety of brats, burgers, salads and sides. The open air patio paired with delicious grub and genuine hospitality from friendly servers, makes Brat Haus the perfect Scottsdale spot for a casual lunch or dinner. Elevate your merriment by enjoying one of the patio games including bag toss, ping pong, darts and life-sized Jenga. The patio is also a dog friendly zone – so be sure to bring Fido along for the fun. Brat Haus is located at 3622 N. Scottsdale Road, Scottsdale, AZ 85251 and is open on Sunday-Thursday, 11 a.m. – 10 p.m. and Friday-Saturday, 11 a.m. – 11 p.m. Visit Brat Haus online at www.brathausaz.com to view upcoming events and for the full in house and catering menus. Also, be sure to give us a “like” on social channels at www.facebook.com/brathausaz. ← Previous Previous post: Jazz and Jambalaya Returns to Southern Rail!